What's this particular post all about? I was contacted asking if I wanted to participate in a blogging campaign to raise awareness of the importance of using recyclable and sustainable materials when publishing books. This campaign is being organized by Eco-Libris, a green company working to green up the book industry. A full list of participating blogs and links to their reviews is available on Eco-Libris website. I've talked before about how I really think that each family is responsibility to decide how they can best take care of that which they have dominion over. I don't think that everyone, everywhere should be forced to think like I think, and do what I do. And I really don't find it very practical to "plant a tree for every book I read." I don't have enough yard space for that! That said, I DO think it's a good idea to use recyclable materials in the publishing industry if it is at all possible. I know there are various factors to consider, but one option worth considering could be using such materials, could it not? With those thoughts in mind, I agreed to participate. 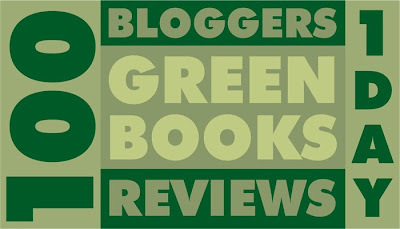 So at this exact moment, 100 bloggers from around the world are posting their book reviews of green books (those that are meeting the "green" criteria (recycled or FSC-certified paper). We got to select titles of our choice and so I thought I'd check out a children's book title. 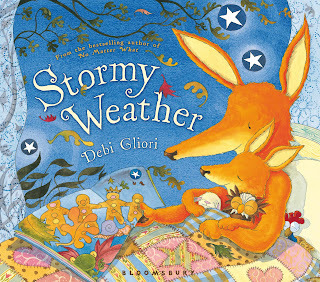 Stormy Weather by Debi Glori (published by Bloomsbury) focuses on bedtime rituals and assuring little ones that even though it may be a bit stormy outside, they are safe inside with their parents. It's a cute book to read with kids who perhaps aren't all that keen on thunderstorms (maybe like mine!). It is told in rhyme and the words swirl around the illustrations which gives it a whimsical feel. and keep you safe all through the storm. It's definitely a cute book and we enjoyed it. Definite thumbs up on the complimentary illustrations. But the real point of the post is just being conscious of what materials publishers are using within the industry. Again, I think it's a good idea to be conservative with the materials that we have available to us and to 'take dominion' of the earth by caring for it as best as we can with the resources that God has given us. I'm not interested in cracking the whip and making demands by any stretch of the imagination. I'm not for more government regulations in this area. Rather, I'd rather we, as fully capable human beings, figure out the best way to care for that which is under our control. I'm not on a bandwagon. But I am for thought and consideration. So here ya go! Something to think about. Have you ever thought about how the publishing industry could change to become more green? Quite frankly, I'm more for them finding environmentally friendly printing materials over offering books in a .pdf format. I will die on whatever hill I have to, arguing for having a good old fashioned book in hand to read and enjoy. I can be for green and still be for an actual book....let me just make myself clear here. (ha) Book. In my hand. That I can feel. And smell. Just sayin'. If you'd care to learn more about this topic, it might be helpful to begin at the beginning (in this country anyway). 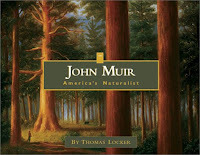 I have a children's picture book to review and giveaway on John Muir: America's Naturalist (Fulcrum Publishing). Hop on over to THIS POST to read my review of John Muir and to enter to win a copy. I also reviewed one of Debi Glori's books on my blog for the Green Books Campaign. Her illustrations are quite beautiful. The bummer about so many green books is that they are so expensive! We are big fans of recycled materials, we recycle everything we can and I am happy to note that our recycle bins are much fuller then our trash bin! My favorite recycled material so far: Elephant poop paper. Seriously! This sounds like a great book for kids. Thanks for the review. I also participated in the Green Books campaign and reviewed Saffron Dreams. I love Deb Gliori's picture books - I use many of them in my preschool storytimes. I haven't seen this one, though - must get a copy for the library, it sounds, like all of hers I know of, quite wonderful! And thanks for all the thoughtful discussion of what 'green' publishing really means and what it could be. Great points.